Can a Digital Environment be a Living Laboratory? Imagine you are in a high school environmental ecology course. You are trying to learn about stream pH and biodiversity but the concepts seem far removed and readings in the textbook are dry and disengaging. In a laboratory setting you can perform experiments and follow a lab manual to come to predestined conclusions. Now, let’s say that you have access to five acres of land behind your school that is designated to the ecology class. Instead of working only from a textbook you are now able to go out into the dynamic environment and engage closely with the measurements you collect in the field. Perhaps your teacher lets you explore and come up with your own research question. You get on the bus at the end of the day with muddy jeans and a memorable learning experience. Your 15-year-old self has just spent the afternoon lab course in a living laboratory, a space designed for innovation and exploration. Now, replace the gunky mud and learning how to understand the chemistry of the streams with learning how to write functionally. What kind of space is reactive and dynamic while also providing an opportunity for personal growth and an exploration of identity? A space for ownership, creativity, community building and self exploration for writing exists in cyberspace. How digital writing and technology are understood by writers with an educational background on the subject. 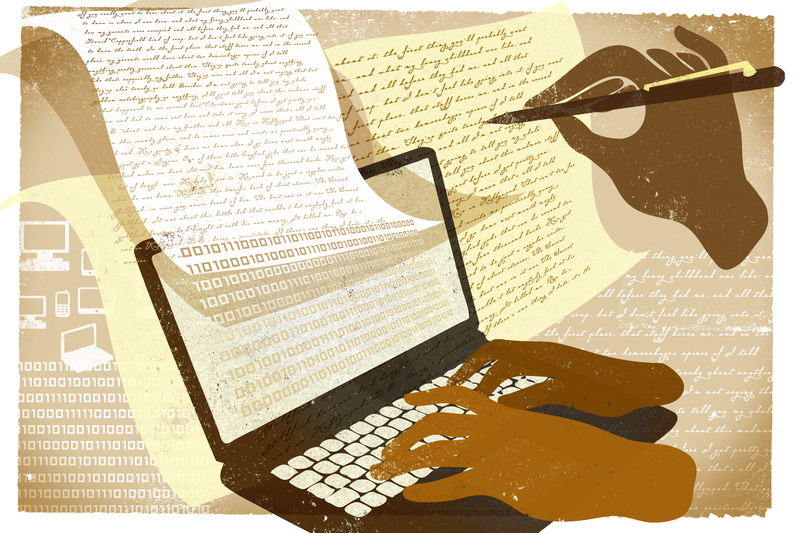 The dangers and the benefits of digital writing for students. How digital writing has impacted my own time as a student. The need for high schools and colleges to have a mandatory course in digital literacy and digital writing. In order to best understand the revolutionary potential in the application of digital writing in the classroom, we first must understand the already existing critical dialogue. Don’t worry, I have already done a majority of the leg work for us…. Building off Barnard’s concept of a digital optimist and a digital pessimist, I invite you into the contradictory world of digital writing criticism. Technology has faced a lot of criticism, especially in regards to how it will impact human interaction. Sherry Turkle in her article “Alone Together” addresses the paradox of technological engagement leading to lack of physical engagement. There is this question of how humans will engage with technology, especially since, according to Turkly, “People are lonely. The network is seductive. But if we are always on, we may deny ourselves the rewards of solitude” (86). Here she grapples with the possible harms of over saturation leading to an overall decrease in personal time and a sense of self. To help articulate her point further, Turkle describes a future with humans so connected that they are disconnected physically. One example explores the relationship between a grandmother and a her granddaughter over Skype. Technology allows them to see each other, but it frees us the ability for the granddaughter to multitask, and therefore be distracted in the conversation. Turkle warns her readers (us) of the possible social negatives technology can bring. “I once described the computer as a second self, a mirror of mind. Now the metaphor no longer goes far enough. Our new devices provide space for the emergence of a new state of the self, itself, split between the screen and the physical real, wired into existence through technology” (92). In the end, she sees the benefits of a technologically hybrid world, yet, she fears a loss of humanity through an addiction to the technological world. This is a fear that dominates many a science fiction novel and is a common argument we are likely to hear from Baby Boomers. Thanks, Isaac Asimov for the horrifying robot future that still haunts my nightmares. The perils of technology in the classroom extend beyond the dehumanization of students and bleeds into the economics of technology. Diane Racitch in her article “Promise and Peril” applauds the possibility of technical teaching tools in schools but warns of the privatization of such seemingly beneficial resources, “They claim to offer customized, personalized education, but that’s just rhetoric. They have high drop out rates, low test scores, and low graduation rates” (167). While the Digital optimist sees technology as a means of creating educational equity, Racitch argues that the resource once created will become a means of making a profit and even a way to further increase the gap between students learning abilities, “Teachers see technology as a tool to inspire student learning; entrepreneurs see it as a way to standardize teaching, to replace teacher, to make money and to market new products” (169). Education is an intersectional issue that combines race, class, ability, and to Racitch, while technology may be the saving grave of educational equity, it is important to keep in mind the motivations of those producing the software. To my internal luddite, Racitch and Turkle make solid arguments for why hybridizing a classroom could be dangerous for students. Toss the computers out the window and bring back the textbooks, my tangible brain screams! But, then another voice kicks in, and this voice calls out my hypocrisy as I write. I am currently on a digital platform, writing to you about that I have learned as I hunted through scholarly readings. It was through technology that I was able to find the information and it is through technology that I will be able to publish this later in the night and hopefully you will read it. While, I must admit, technology seduced me into the rabbit hole of procrastination, but that feels more like an issue of mental fortitude compared to technology. At the end of the day, humans still have the agency to make decisions, and I want to further understand what critics have to say about digital writing. So, I’m going to put my internal luddite on hold and see what other voices there are in this conversation. The more I read Morris, the more I understand his argument that the digital world is one of dynamic change. When you write in this space, yes, your words are initially yours. But! Others will repurpose what we say and the concepts will develop. Instead of writing on a sheet of paper, and the paper getting turned in and forgotten, writing in a digital world is a space with higher stakes. Here, people from across the world can comment on my writing, they can tear it apart, they can challenge me, or we can work together. The internet is a digital writing community. Morris’s argument is all about this communal and living aspect of online writing. Additionally, he argues that “today there is no value to our writing except as it is made useful.” In this digital environment, value is derived from the audience. This attribute of digital writing is why it would be so important to incorporate it into curriculums at the high school and the college level. Students would learn how to cite properly while also learning how to collaborate, it is a writing workshop that writers can take home with them at the end of the day. Danielle DeVoss tackles the importance of digital writing in the National Writing Project’s book titled Why Digital Writing Matters. In this book digital writing in the class room and as a learning tool is justified through its ability to provide a creative means of composition for students. Additionally the applicability of digital writing is explored and how, “Equipping students to write in only one modern—traditionally, black ink on white paper in scripted genres – will not serve students in their higher education experiences or in the workplaces of the future” (5). I really appreciated this aspect of the argument, as it moved to the practicality of writing and how digital writing can help give students an additional means of communication. Another interesting aspect of her argument was about how teenagers have a difficult time realizing that their use of technology, be it texting, Instagram, Twitter, or Facebook are actually valid forms of writing. This way of approaching writing challenges previous conceptions of what writing is, and morphs it into a concept of use. Finally, DeVoss really prioritizes how digital writing is both the use of digital mediums but it is also the presence of collaboration to use those mediums. Just as Morris argues that digital writing is writing in and for a community, DeVoss stresses how the digital writing process can actually teach students how to collaborate. This is the Liberal Arts argument that Dickinson students are familiar with. Through the adoption of a digital writing course into curriculum, students would strengthen another aspect of their academic and practical identity while learning how to work in ground and the importance of collaboration and audience. Naomi Barnes is her article “Learning as Weaving” explores the importance of digital writing in the classroom as a means of deviating from a linear curriculum, highlighting similar importances that DeVoss addressed. Through a metaphor of a spider web, Barnes unpacks the value that that digital writing can offer students. Again, there is the theme of collaboration, “The key is to teach them to collaborate—to weave a web, strong, networked, and expansive. Perfect for catching the elusive creature that is new knowledge.” Knowledge is one hell of an elusive creature, I agree. Barnes then goes to say that in the class room that prioritizes digital writing, students have a chance to become an expert and they are able to learn from each other. This creates a sense of ownership and pride in students for their work and meaningful collaboration is able to occur as a result. Social Media also plays an important role in education as it allows for smaller interactions to occur between students. These interactions can help form community and allow for more substantial interactions over time. While Barnes praises student blog projects as a space for community building and personal development, she does warn that “Twitter and blogs are not the solution for learning, through they have the potential to be a great vehicle for it.” This hybridized approach is the focus of Stephen Barnard’s article “ Building Castles in the air: Critical Digital Pedagogy and the Pursuit of Praxis” where he argues that these should be both digital interaction in class rooms and in person discussion. Similar to how our course is run at Dickinson. His argument supports my idea of a digital environment as a living laboratory when he says, “getting your hands dirty can be fun, especially when you leave room for failure and experimentation.” Barnard expands outside of the class room, justifying the presence of digital writing in class rooms as a means of giving students a more complete tool kit of skills for the world outside of college. The value of digital writing exists within its ability to create a community for writers, a space for exploration and for experimentation. In a world where risk taking is vital to successful careers, learning at an early age how to use your voice and take academic risks in a digital world could really benefit students for their future. Let me take you back to the high schooler spending their lab course outside in a space that encouraged collaboration and innovation for the students. I think it is important that we remain optimistic but realistic with our expectations of technology as a living laboratory for writing. However, a hybrid teaching environment would be benificial to students, and I know this from my own experience. While not taking place directly in the academic sphere, my first profound moment with digital writing was when I started writing fiction and poetry online. I would finish my homework, excited to write for an audience that spent the time to read what I had to say. I quickly developed stories, intricate characters, and developed a voice as a poet (to some extent, of course). This space, outside of academia was extremely supportive and encouraging for me and I felt a strong sense of belonging both as a writer and as a thinker. When talking about digital writing the word “community” is a buzzword. I truly experienced a community on Wattpad, even co writing stories with women in Australia! We connected and created over a space without the need for face to face interaction and what we created was consumed by others in the space and was capable of bringing them enjoyment. Getting positive and constructive comments on pieces only drove me to write more, and to challenge myself in different ways. This was my first true interaction with digital writing and it was formative for my love of the writing process and my desire to be an English Major. Imagine how empowered students would be in high school courses if they had to maintain a blog that developed alongside their personal growth. For the students that took it seriously it has to potential to be powerful. Now, I am a college level writer (you may not know that from this post, but I promise, get me writing on poetry…and). Digital writing has a different meaning to me now that I am taking a course on digital writing. As an aspect of the course I am able to curate and maintain my own blog. This blog of mine is devoted to Writing, cliché, I know. It is going to become a space for me to document my writing process, further explore what it means to write, and possible be a space to share some of my own creative writings. Digital writing has always been a space of self expression, and this course only allows me to better understand the technicalities of making that self expression more impactful. The most impactful aspect of blog writing is that it allows for the development and the refining of an authorial voice. Other students would greatly benefit from the incorporation of digital writing into their lives or their education as it would give them a reason to experiment with writing and how they communicate over a formalist platform. Another aspect of digital writing that I find interesting is its ability to help your writing in general. In order to be an effective digital writer, you must be concise and able to prioritize. I am still learning how to do that with my own writing, but if I had not taken a digital writing course the implication of boring or dragging writing would not be as apparent. In my life right now I am trying to decide what it is that I want to do after college. One possible avenue of employment is to work with a non profit with their social media or digital presence. I am especially interested in how museums communicate with the public and strategies for making natural history more accessible to low income people. The digital ecosystem may be my way to help make these collections and information more attainable for those who are interested. Also, the skills that I am learning as a digital writer such as a need for creativity, mculimodality, and the mechanics of the digital world will help make me a more appealing job candidate as I have experience navigating an often overwhelming environment. In the same way that students are learning about ecology by playing in a bog, I am learning about writing by playing in a blog. Barnard, Stephen. “Building Castles in the Air: critical digital pedagogy and the pursuit of praxis.” Digital Pedagogy Lab, 1 Sept. 2015, http://www.digitalpedagogylab.com/hybridped/building-castles-in-the-air-critical-digital-pedagogy-and-the-pursuit-of-praxis/. Accessed 31 Oct. 2017. Barnes, Naomi. “Learning As Weaving.” Digital Pedagogy Lab, 10 Nov. 2015, http://www.digitalpedagogylab.com/hybridped/learning-as-weaving/. Accessed 31 Oct. 2017. DeVas, Daìnielle. Because Digital Writing Matters. Jossey-Bass, 2010. Print. Morris, Sean Michael. “Digital Writing Uprising: third-order thinking in the digital humanities.” Digital Pedagogy Lab, 8 Oct. 2012, http://www.digitalpedagogylab.com/hybridped/digital-writing-uprising-third-order-thinking-in-the-digital-humanities/. Accessed 31 Oct. 2017. Ravitch, Diane. “Promise and Peril.” Technology: a reader for writers, edited by Johannah Rogers, Oxford University Press, 2015, pp. 167-169. Turkle, Sherry. “Alone Together.” Technology: a reader for writers, edited by Johannah Rogers, Oxford University Press, 2015, pp. 85-95.